Postcard GB-465150 from the United Kingdom shows a traditional British dish "Bangers & Mash" made of sausages and mashed potatoes. 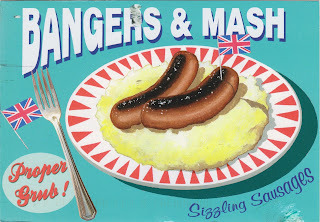 The flavored sausages can be ordinary pork or beef British sausages, or Cumberland sausages that are usually very long and rolled in flat, circular coils. The dish is sometimes served with gravy, fried onions, baked beans and peas, instead of mashed potatoes. In the United States, the dish is often found at the ubiquitous Irish-themed Pub, although it is not any more popular in Ireland than in other parts of the British Isles. In Las Vegas, you can find it at the Nine Fine Irishmen in New York New York, Todd English Pub at the CityCenter and many other places.